The appearance of "Ectoplasm" in photographic images has been happening since the mid 1800's. The images were considered to show proof of a spirit/trans medium's communication with the dead. This type of image is making a comeback however it has many new styles. N: The outer relatively rigid granule-free layer of the cytoplasm usu. Held to be a gel reversibly convertible to a solution. 2. A substance drawn out of a physical mediums body through any orifice. The “Ectoplasm” can form into hands, faces, talking shapes and many other things. 4. Uncondensed Spirit energy that has not yet formed into an Orb. 5. A substance used by “Physical Mediums” at the turn of the century made from substances such as muslin, egg whites, gelatin, soap and many other things to create a “residue” of the Spirit. In 1848 Kate and Magarette Fox started what the spiritualist movement. They were world famous for having séances in which they would communicate with the dead. In their later years Kate and Margarette confessed to faking the séances and stated that all of the sounds and movement of objects had been done by themselves or that assistants had helped them. In the early 1900s the Spiritualist movement had taken over, and people throughout the world were having Séance parties. But more important the title of “Physical medium” was born. The Physical medium would communicate with the dead. The communication from the deceased would usually consist of strange tapping, disembodied voices and sounds, phantom music. Sometimes even the appearance of objects such as floating trumpets. This was also the time that Ectoplasm made its appearance. Professor Charles Ricket a former president of the Society for Psychical Research was the first to use the term. He stated that it was “a substance that comes from the body of a psychic medium during a séance”. It was also said that Ectoplasm was very sensitive to light, and if exposed would hurt or possibly kill the Physical medium or it would turn to a fine powder. The only modern reference to Ectoplasm was in the movie Ghost Busters when Bill Murray was “Slimed”. The concern today is not that people are intentionally faking Ectoplasm, but rather that they have taken the name and applied it to something that they do not understand. What is happening today is images that have been captured that include images of either Cigarette smoke or a reflection of the photographers breath that has caused moisture in the air just in front of the camera. 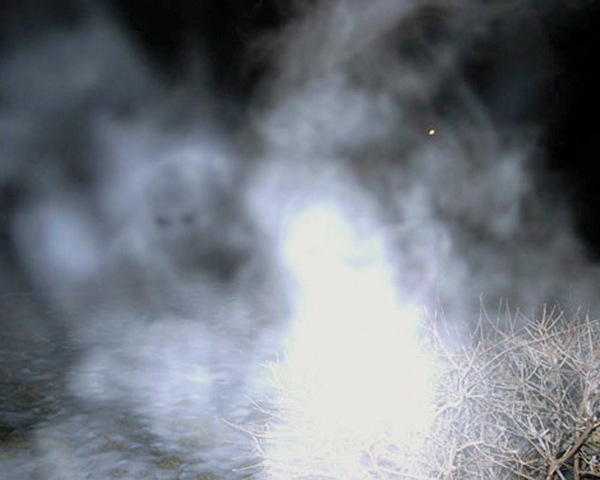 This common misunderstanding has similarities with the Orb phenomena, such as the photographer does not see the image when it was captured and they are looking for something paranormal in the image. This type of image can also be caused by lens flare that includes "Ghosting" in the lens. 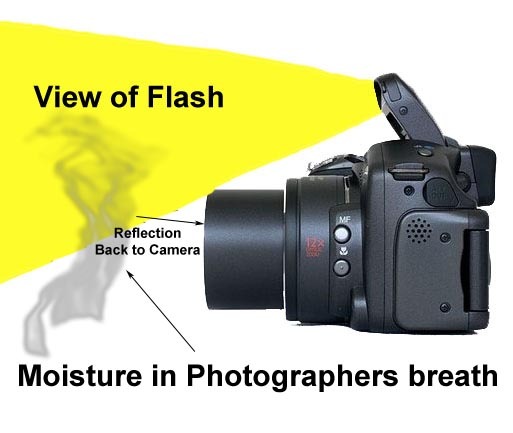 This illustration shows how the photographers breath is reflected back into the camera to cause a Ecto/Mist image. This is an example of a standard ectoplasm photo. If you look closely you ca see a skull looking back at the camera as well as the silhouette of a man. because of the moisture the flash caused a mist in the air. Just like the “Orb” phenomenon, Ectoplasm has become a way for the new “Ghost Hunters” to have instant gratification in their results, and because of inaccuracies like this we are just moving farther away from actually finding the truth.